My my – you wait ages for a bus and two turn up at once er… I meant football teams. It is interesting to note that two of the players are wearing ties and one is sporting a cap – all of that would be curious to see in modern teams. One of the supporters is smoking so … a ban on drink but not on fags! Does anyone recognise a long lost relative? 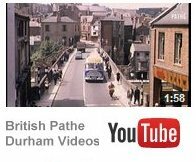 Do you reckon the picture was taken at Broadgate? 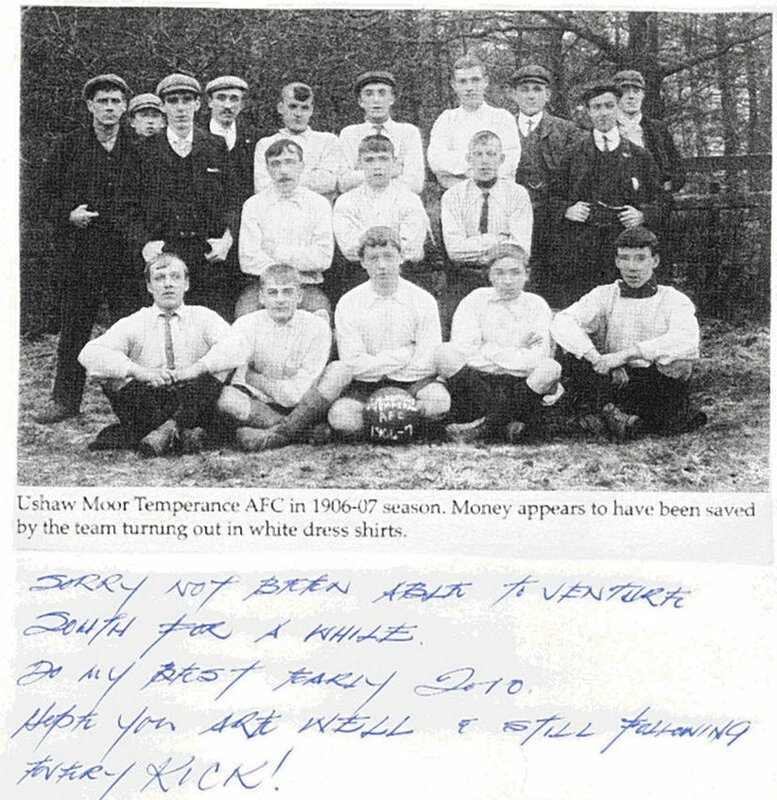 I wish to thank that splendid chap Keith Belton, of the Durham Amateur Football Trust, for this photograph – it formed page three of the Christmas card he sent me. And what an interesting page 3! If there are any other appropriate acknowledgements to make in respect of the photograph I will gladly arrange it: please contact me if that applies. 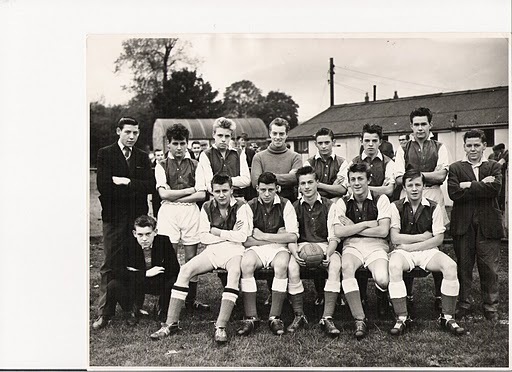 Here we have a photograph of the Durham Boys football team with their captain Norman Ferguson of Ushaw Moor, his best friend the late Les Gleghorn to his right ( both Johnstonians ) and then Vic Meredith of Pittington School. 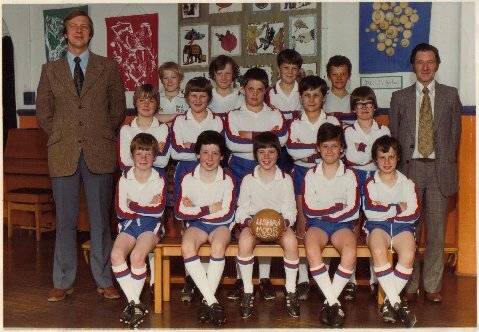 On the top row we have identified Brian Crampton, Ian Pattison ( South Hetton ) and Robert Hancock. Can W.B. identify himself please and anyone else he is able to. Sammy was the most famous professional footballer to come out of the Deerness Valley. He was born in Bearpark on the 16th of January 1908 and my understanding is that he was one of seventeen children. He had a spell with Tow Law, as well as Durham City, but in 1927 he signed for Derby County. His first game for Derby – known as the Rams – was in a 2-1 win over Leicester City. He became one of the very best outside rights in the English game and in 1930 he got his reward with a debut for England against Scotland. For the record the score in that game was England 5 Scotland 2. In the following year he scored twice against Spain in a 7-1 victory! 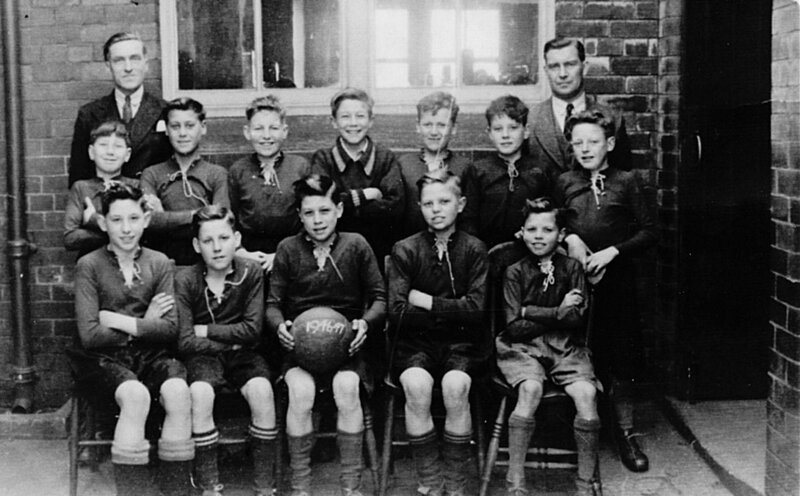 The first serious challenge to Sammy’s place in the England team came from a man called Stanley Matthews – have you heard of him? Mind you I understand that once a judge stated that he had never heard of the Beatles so there is no absolute certainty that you have heard of Stan Matthews, or Sammy for that matter. Sammy Crooks and Raich Carter formed a very good partnership in the Derby team but very unfortunately Sammy sustained an injury and missed out on playing in the very first FA Cup Final after WW2 – in which Derby beat Charlton Athletic 4-1, after extra time. All in all Sammy scored 101 goals for Derby in 408 games. After hanging up his boots he had several spells as a manager ie with Retford Town, Shrewsbury Town, Gresley Rovers, Burton Albion and Heanor Town. Sammy was at one time Chief Scout for Derby and also spent many years serving as Secretary of the Football Players Union. Sammy is sadly no longer with us having died at the age of seventy three. Sammy’s wife, Freda, dedicated a huge part of her life to teaching children and many others to swim. Although she had retired as a swimming teacher at Derbyshire County Council, when 64, she then went on to teach at a sports centre. She really was dedicated to teaching swimming and did it with great distinction! Freda was an avid Derby fan right up to her death at the grand old age of 96. Yes – she had good taste. I did actually ring her about 12 or more years ago because of a what seemed to be a horror story in my family. I was encouraged by one of them to believe that my great grandfather possessed one of Sammy’s football caps. I later found out that Sammy had one of his caps stolen. I panicked a bit at the thought that my great grandfather had possible secured one of Sammy’s caps in doubtful circumstances. I telephoned Freda and she confirmed that a cap had been stolen but she assured me that it could not have been my great grandfather that had done the dastardly deed! Family honour was saved and I felt guilty to even doubt my great grandfather; afterall he was a fine man himself – a gentleman infact!